Here's something to ruin your nice day: a 300-mile algae bloom is predicted for Lake Erie this summer. 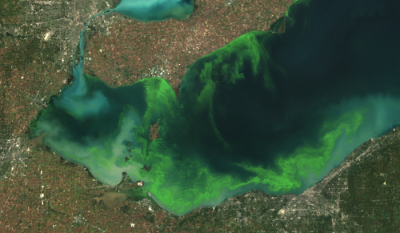 NOAA and its research partners predict that the 2013 western Lake Erie harmful algal bloom (HAB) season will have a significant bloom of cyanobacteria, a toxic blue-green algae, this summer. The predicted bloom is expected to be larger than last year, but considerably less than the record-setting 2011 bloom. Bloom impacts will vary across the lake's western basin. The forecast calls for a bloom that is about 300 square miles at its peak. That's nearly twice as large as last year's, but about one-fifth the size as the one that stretched from Toledo to Cleveland in 2011. Toxic algae, also called cyanobacteria, are common in most lakes, but grow thick feeding on phosphorus in manure, fertilizers and sewage that rains wash into streams. The algae produce liver and nerve toxins that can sicken people and kill pets and wildlife. It is one reason the algae are deemed a dire threat to the Lake and its $10 billion annual tourism industry. Algae also help create an oxygen-depleted zone in the center of Lake Erie where nothing can live, including fish. A sudden shift in this so-called dead zone was suspected of killing tens of thousands of fish that washed up on beaches in Ontario in September 2011. Really, if there's a culprit in the 2011 algae bloom – and the others in recent years – it's climate change, which, according to climate models, is responsible for the increase in early storms' frequency and intensity. And, according to [Stanford researcher Anna] Michalak, that will likely only continue. "We're not expecting a shift in the total amount of precipitation," she said, "just in the timing and intensity." Rising temperatures also means that Lake Erie's waters will likely continue to trend warmer in the spring, too. "There are some recent papers suggesting wind speeds on Lake Erie are likely to decrease as a result of climate change," said Michalak, "or have already been observed to decrease." Wind pushes water, which creates current. With decreasing wind and current, Lake Erie's spring waters will be more suitable for the growth of algae. So there's that. Enjoy your summer. Lake Erie Skimboarding: Wave of the Future?